When it comes to desserts, I’m not much of a Martha Stewart. I believe my problem stems from a lack of patience and a plethora of clumsiness. This cheesecake tastes amazing, but looks wise? Cute, decorative green icing wise? Not so much. 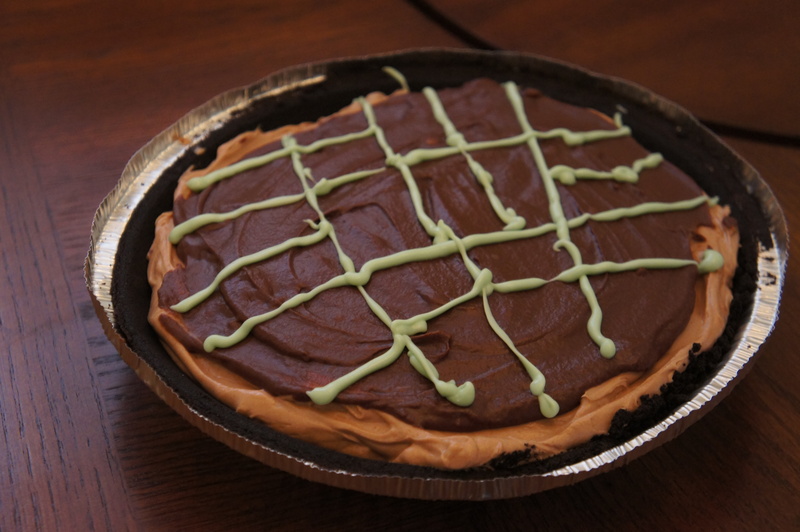 If my life were a TV show and I accidentally dropped this pie on the ground and bought one at the grocery store to cover, everyone would know. The purchased one would be perfect and mine are… quirky. I have another confession. 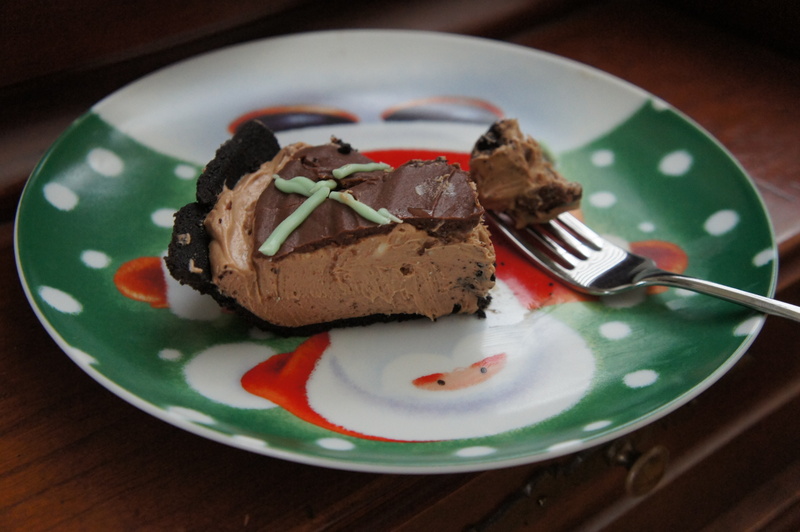 I mentioned last week how I’m obsessed with Nestle Dark Chocolate & Mint morsels. Well, in my sick state, I decided to surf their website for more recipes using the chips because I had already eaten the cookies AND the brownies listed on the back of the bag. Wow, there are a lot of recipes. However, once I saw cheesecake, I knew which one I would be making. It’s not a traditional cheesecake by any means. 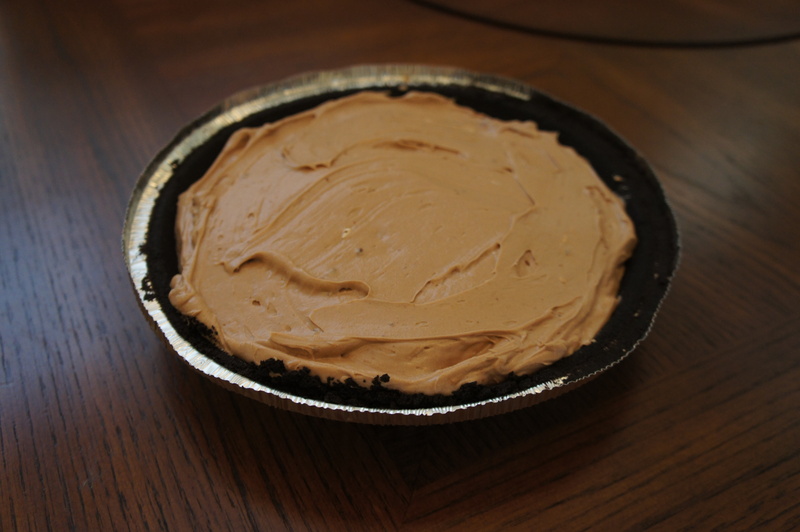 I would probably call it a cheesecake pie. I love that it’s two layers. You can enjoy the delicious morsels with cream cheese and then all by themselves in the ganache. I tried to replicate the box-like icing pattern from the website, but seriously, just make a tree or a snowflake or something. I regret my decision. Set aside 1/2 cup morsels for ganache topping. 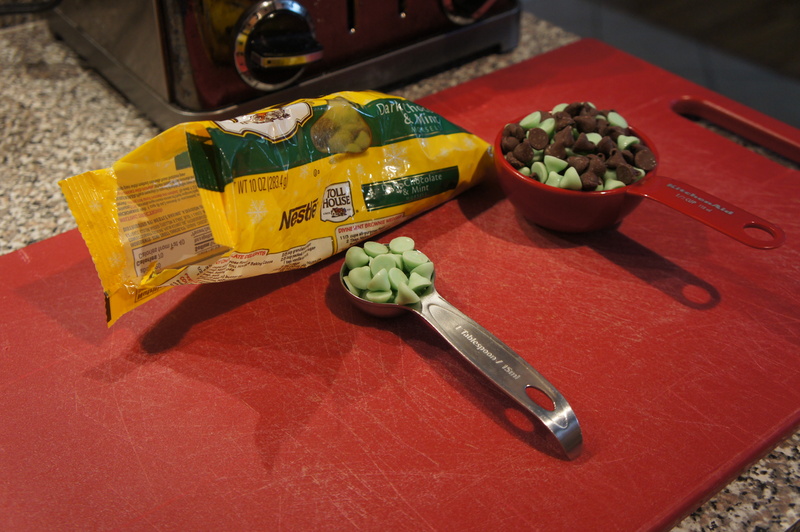 From remaining morsels, sort out 1 tablespoon green morsels and place in small ziploc bag for drizzle; set aside. Melt remaining morsels in medium, uncovered, microwave-safe bowl on 70% power for 1 minute; stir. The morsels may retain some of their original shape. If necessary, microwave at additional 10-to-15-second intervals, stirring just until smooth. Cool slightly. Beat cream cheese, brown sugar, granulated sugar, 2 tablespoons cream and vanilla extract in mixer bowl on medium speed for 2 minutes. Add melted chocolate; continue beating for 1 minute. Spoon into crust and smooth top. Microwave remaining 2 tablespoons cream in 1-cup glass measure for 20 seconds on high power or until boiling. 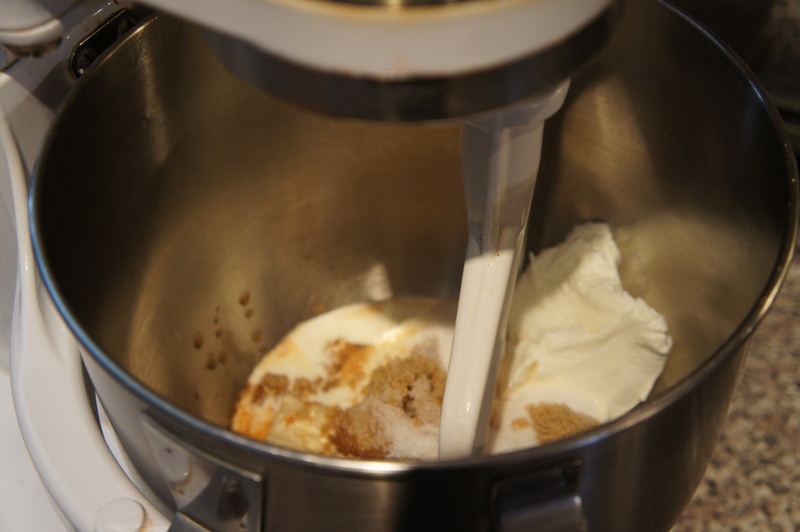 Add reserved 1/2 cup morsels to cream; let sit for 1 minute. Stir until smooth. Cool for 5 minutes. 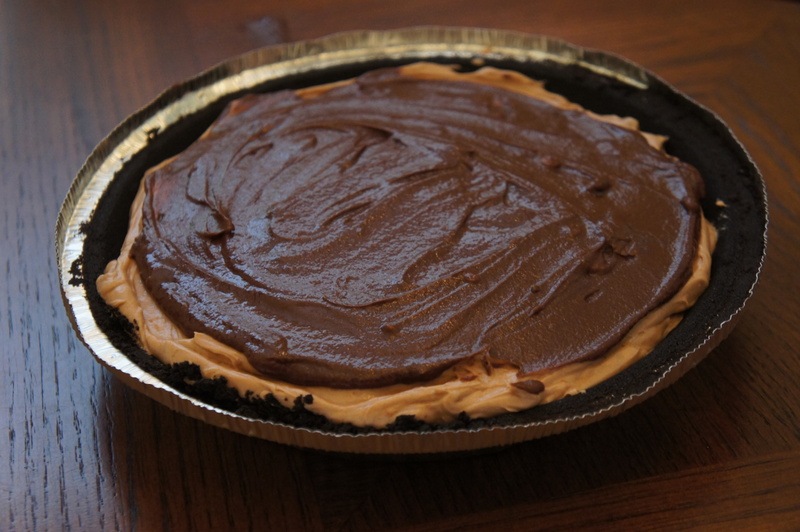 Spread ganache over cheesecake to within 1/4-inch of edge. Microwave reserved mint morsels in bag on 70% power for 20 seconds; knead. Microwave at 10-to-15-second intervals, kneading until smooth. Cut tiny corner from bag. Drizzle over top of ganache. Refrigerate for at least 2 hours. That slice looks so good, thanks for sharing! Those dark chocolate and mint chips are sinful!! Purchase them ASAP!!! Sinful is a good way to describe them!